Together with our comrades of the Rojavakommittéerna, a nationwide network of independent leftist and kurdish groups in Sweden, we distribute this shirt in solidarity with the resistance and the social revolution in the west-kurdish regions of Rojava. The sale is bounded in a current donation campaign of these comrades. The profits will directly be forwarded to Rojava to support the rebuilding of Free Kobanê after the brave and heroic victory of the People’s defence forces YPG/YPJ against the fundamentalist terror of the „IS“ in January of this year. Order here. SUPPORT THE REVOLUTIONARY PROCESS IN KURDISTAN! LONG LIVE THE RESISTANCE OF ROJAVA! 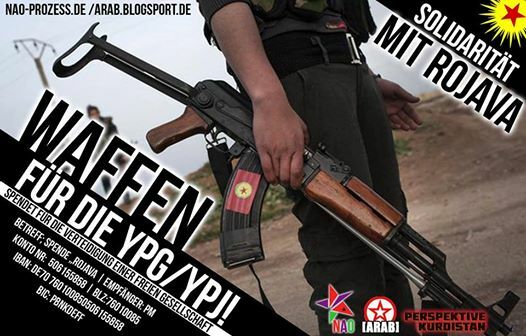 Du browst gerade in den Fire and Flames Weblog-Archiven nach dem Tag 'ypg'.